For more and more government agencies, desktop virtualization is proving to be the right solution at the right time, according to a recent survey conducted by the 1105 Government Information Group. The technology, which makes it possible to deploy, manage and optimize desktop-based applications and data from a central console, can help agencies extend desktop computing resources to a wide range of end-user devices securely and cost effectively, whether users are in the office, on the road or working at home. 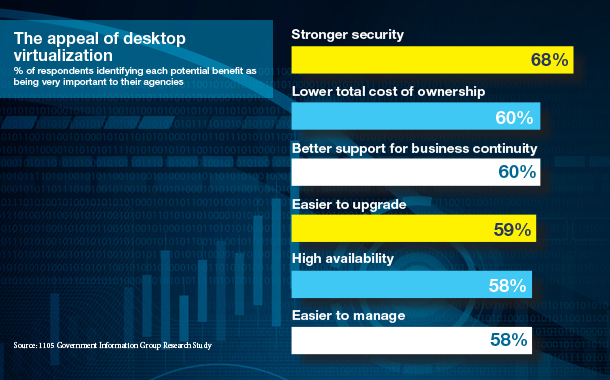 The survey found that 35 percent said their agencies had fully implemented desktop virtualization, 30 percent said their agencies are in the process of deploying it and 26 percent said their agencies are investigating it. Only 9 percent said their agencies had no interest in the technology. And the interest in desktop virtualization is growing steadily, the survey found. In the past two years, the percent of respondents’ co-workers benefiting from desktop virtualization grew from 32 percent to 43 percent. In the next two years, that number is expected to reach 60 percent. Security is a major concern. End users increasingly are looking to access applications and data from outside the office – and often using their own devices, whether that’s a laptop computer, tablet or smart phone. Virtualization is appealing in such an environment because applications and data can be stored centrally, not on the device itself, limiting the damage when a device is lost or stolen. It is not surprising, then, that the survey of federal, state and local information technology professionals found that 68 percent of respondents said the promise of stronger security was a very important consideration, with another 27 percent saying it was somewhat important. Case in point: The Navy plans to test the use of desktop virtualization as part of the Navy/Marine Corps Intranet program. According to an August memo from Navy Chief Information Officer Terry A. Halvorsen, one of the primary benefits of the Hosted Virtual Desktop (HVD) initiative is that the department can provide equally secure access to resources through government- and employee-furnished devices alike. In either case, the Navy will be able to limit those devices’ ability to process or store information locally. Additionally, the virtual desktop approach also will let Navy IT administrators centrally manage security patching and updating, the memo states. The pilot program will cover up to 7,500 users. Until this limit is reached, all NMCI desktops due for a technical refresh will be considered for inclusion in the pilot. “Maximizing this pilot will allow the [Navy Department] to fully evaluate functionality, costs and risks associated with HVD,” the memo states. Meanwhile, the Defense Information Systems Agency is looking to develop a virtual thin client for mobile devices that makes the most of the Defense Department’s Common Access Card (CAC) to secure access. The thin-client solution must work easily on devices whether they are government- or employee-owned, according to a broad agency announcement released last year. DISA officials also would like a solution that works on multiple commercially available devices, but they are willing to accept a more limited choice of platforms in exchange for meeting their full range of requirements. Those requirements include CAC-based authentication, data-in-transit encryption and Secure/Multipurpose Internet Mail Extensions for providing digital signatures and encryption of government e-mail. According to the 1105 Government Information Group survey, another concern is the long-term cost of managing the increasingly complex government IT enterprise. As the number and range of devices continue to grow, IT shops may find themselves needing more employees to keep up with user requirements, which can be an expensive move. Virtualization can help keep those costs in check because the applications and data are stored, administered and upgraded locally. For 60 percent of respondents, lowering the total cost of ownership was a very important benefit, with another 36 percent saying it was somewhat important. Total cost of ownership is a big concern of officials at the Homeland Security Department. In a speech last May, then-CIO Richard Spires said the department’s workplace-as-a-service initiative would reduce the money needed to support desktop computers and bolster DHS’ mobile strategy. In fact, according to the Obama administration’s fiscal 2014 budget request, DHS expects to save more than $150 million between fiscal years 2012 and 2016.